The Sustainable Sky Airline Disclosure Project will work to educate and raise awareness at airlines regarding the value of sustainability reporting. It will also create annual leader boards and awards to encourage competition for sustainability transparency, in line with world's best practice. Generally speaking, airlines are considered inconsistent and poor at tracking and disclosing their sustainability metrics (such as greenhouse gas emissions, waste production, electricity consumption, Lost Time Injury Frequency Rate, employee gender ratios etc). This is usually because many airline executives do not understand the benefits of doing so, how they can create value from the information and are fearful that something unfavourable may be uncovered. Conversely, investors (particualrly sophisticated insitutional investors and banking analysts) love company reporting transparency as it helps them to better quantify risk profiles when evaluating companies. Where there is a lack of information or uncertainty investors usually need to assume the industry average to worst-case is occurring and lower the company valuation accordingly. Increased disclosure improves confidence that everything at the airline is healthy behind the scenes. 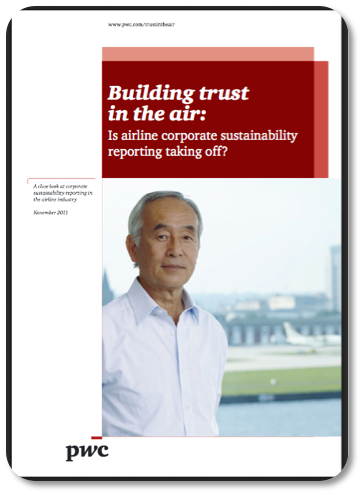 Detailed and transparent sustainability reporting indicates that a company, especially its overall reporting function, is healthy. It indicates that in all likelihood fewer value-destroying hiccups will occur and no revisions of company accounts will be required. With consideration to the saying "what gets measured gets done" the disclosure of consistent sustainability information will lead to improvement in overall airline sustainability over time. The Sustainable Sky Airline Disclosure Project will work to educate airline-reporting managers of the value of sustainability reporting as well as creating annual leader boards and awards to encourage competition for transparency. documents should be reviewed and assured by a reputable independent (ideally 'big four') auditor supported by an unqualified opinion statement. To encourage this, and a corporate culture of sustainability transparency, airline CEO’s should include a signed statement at the beginning of the annual company Sustainability Report stating “all information contained is true and accurate to the best of his/her knowledge”. Global airlines should also be signatories to key sustainability pledges; such as the SAFUG pledge and the UN Global Compact pledge. Sustainable Sky's view on this matter is supported by PriceWaterhouseCoopers ('Building trust in the air' report, PwC) who recommend that the best airline corporate sustainability reports of the future will be integrated with traditional annual reporting, be verified to a high standard by an independent third party, will use established guidelines such as the GRI supported by sector standards, will integrate new tools such as XBRL so that analysts and apps can extract useful data accurately and quickly, will be relevant for a broad audience, will explain stakeholder concerns and how the business is addressing them and will use case studies and qualitative data to help bring the facts and figures to life but will avoid exaggeration and over-flowery sales talk. Longer term, this project will also work to incentivize the release of sustainability metrics that are predominantly unique to the airline industry, such as; international/domestic carbon emissions split, fuel/oil spills on the ground, fuel dumping occurrences whilst airborne, airline flight operation on-time performance factors, environment department budget disclosure as a % of total revenue and headcount in the sustainability department, fuel consumption per payload tonne-kilometre, emergency humanitarian disaster response freight uplift for the year in tonnes, utilities consumption (water, gas, electricity, waste disposal), broader jobs created, plus direct and indirect economic impact. A sustainability reporting director will be employed to deliver the Sustainable Sky Airline Disclosure project. Thank you for donating to this important project that with will support our pursuit of a global sustainable air transport system.